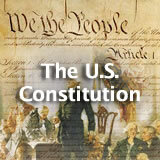 The U.S. Constitution unit contains 17 learning experiences. 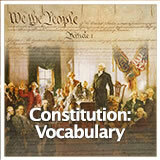 Students engage with key vocabulary related to the U.S. Constitution. Students learn about the first stages of the U.S. Constitution—the debates behind the drafting and signing of this document. They'll discover when and why this document was written, the two main plans that were proposed for the nation's government, and the compromises that were reached before the delegates would sign the document. Students explore people, ideas, and documents that shaped the U.S. Constitution, including: the Magna Carta, the English Bill of Rights, Charles de Montesquieu, and John Locke. Then they look at influences from colonial America. Students will learn about the ratification of the U.S. Constitution—when the people of each state voted whether or not to accept this new government for the nation. Students collaborate in small groups to explore the two main factions in this debate, the Federalists and the Antifederalists, and to understand how the document was finally ratified. Students learn about important figures who shaped the U.S. Constitution and the nation's first government. First, they explore three paintings of the Constitutional Convention. Then, they learn about the delegates as a whole, and identify similarities among all or most of them. Next, they will research and answer questions about individual delegates, including how they shaped the Constitution. Finally, they'll read the notes from their classmates and write a conversation, letter, or journal entry that compares and contrasts their delegate with another. 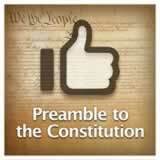 Students will discover how the U.S. Constitution is organized into the Preamble, the Articles, and the Amendments. Next, they'll explore the meaning of the Preamble by reviewing important vocabulary and the main "goals" it lays out for the Constitution. Then they'll work in small groups to illustrate one goal of the Constitution. 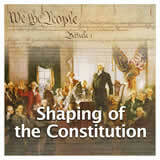 Finally, they'll reflect on and illustrate the meaning of "We the people" in 1787 and today. Students analyze seven basic principles reflected in the U.S. Constitution: limited government, republicanism, checks and balances, federalism, separation of powers, popular sovereignty, and individual rights. They also discover how these principles are reflected in the framework of the U.S. government, as established by the Constitution. Finally, they explain how selected excerpts from the Constitution reflect one or more of these principles. Students explore the powers of the three branches of American government: legislative branch, executive branch, and judicial branch. They also describe and give examples for the process of checks and balances between the three branches. Students review the concept of federalism and identify some of the powers of federal and state governments. 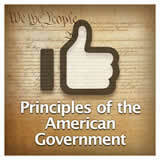 Then they analyze the structure of state governments and their similarities to the federal government. Next, students explore levels of local government and the services they commonly provide. Finally, they'll identify people in each branch of their own state government. Students review the history and significance of the Bill of Rights. Then they identify and describe the rights and freedoms protected by these ten Constitutional Amendments. Finally, they read about a landmark Supreme Court decision and explain how it helped to define a particular right or freedom in the Bill of Rights. 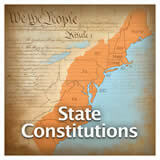 Students learn the process for changing, or amending, the Constitution. Then they explore Amendments 11 through 17. They describe some amendments related to the election process, explain what the prohibition amendments tell us about the process for changing amendments, and develop a timeline of amendments granting or expanding individual rights. Finally, they explain which amendments since the Bill of Rights they think have had the greatest impact on life in the United States. Students discover how someone becomes a citizen of the United States, the process of naturalization, and the rights and responsibilities of non-citizen residents. 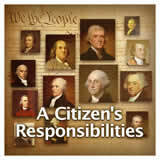 Then they identify the rights and responsibilities of U.S. citizens and the responsibilities of young people as citizens. 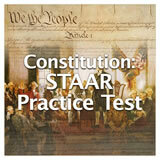 Finally, they take a sample "naturalization test" and see how they would do answering questions about U.S. civics. Students explore core democratic values in our nation. First, they consider core values in their classroom and school. Then they examine text from three famous documents and see if they can identify fundamental beliefs that define and shape our nation. They learn about ten core democratic values and write definitions for them. Next, they create a visual representation of a democratic value in action, and describe their visual for the class. Finally, they identify the main democratic values behind important legislation. The Complete List of Units in the Grade 8 English Language Course. 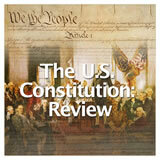 including the The U.S. Constitution Unit.